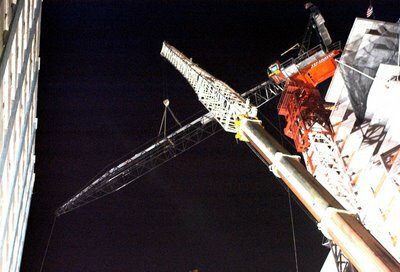 For me , probably the most troubling problem of all with this event is the damaged steel restraining pocket which held the 40000 lb.s of counterweights. Whatever mistakes were made ,whatever important systems failed ,whatever incompetant or unlicensed operators were invovled, it is still this damaged restraining pocket that haunts me . The steel forming this pocket was not only just bent or crumpled it appears to have been torn . 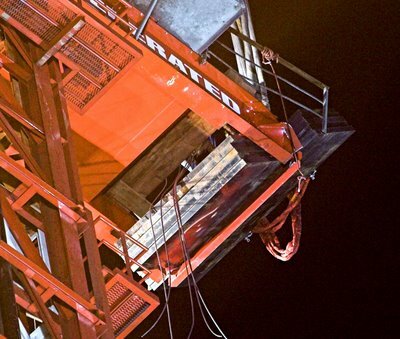 If the steel of this pocket had torn through completely the counterweights would certainly have fallen to ground leaving the crane seriously out of balance with the torque generated by the 14000 lb concrete cube resisted largely by the redish-orange frame surrounding the uppermost portion of the tower .This condition would have made it more likely that the crane or some portion of it would have been pulled over , toppling to ground .This was a disaster as it happened but if this restraining pocket had failed to hold the counterweights it would have been a much more serious disaster . We were just lucky this time . 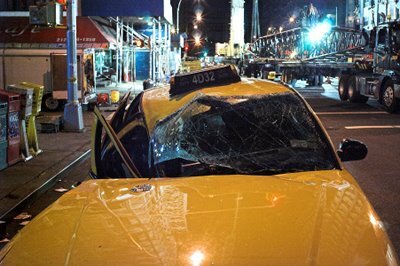 Above :The condition of the tower crane about 1 1/2 hours after the section had fallen to ground crushing one side of a taxi cab. The stability of the tower at this time is in question . Above: The upper part of the tower crane . Note the orange tower section with- in the red frame . This orange section is now the top tower section . The white section that fell to ground was previously in this position. The tower section that fell to ground had just been removed from the top of the tower :unbolted from the hoisting system above and the tower section below and rolled out to be picked later by the crane on the projecting boom above that looks like a "diving board ". In fact this boom is sometimes refered to as the "diving board ". 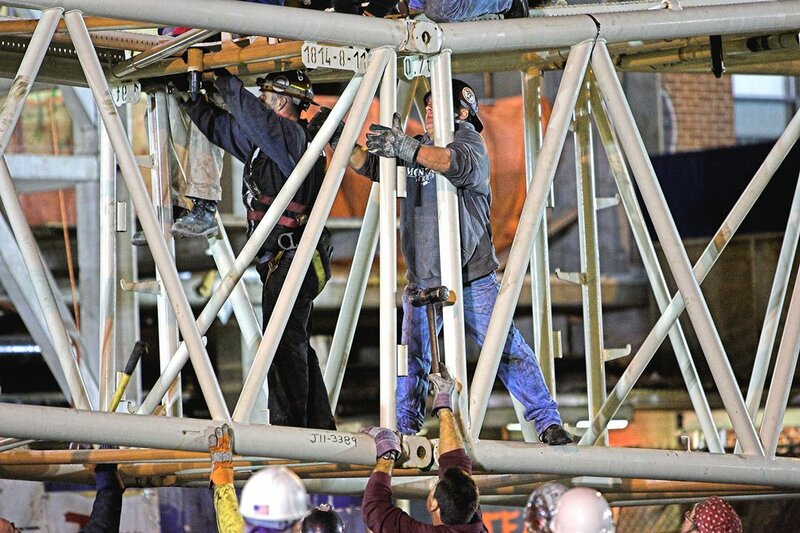 Under normal operating conditions all sections are bolted together and also the hoisting mechanism is bolted to the top of the tower . 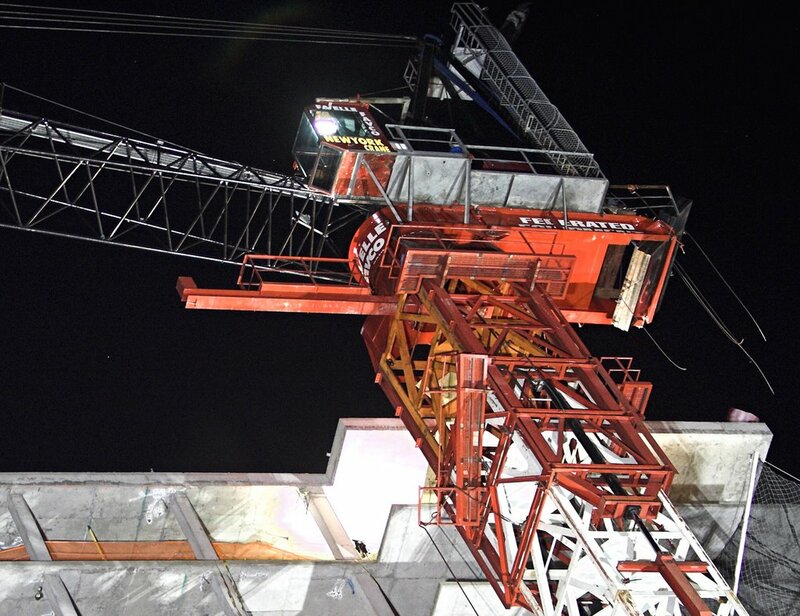 During the process of removing a tower section this is not the case thus it is critical that the upper hoisting assembly of the crane be balanced dead neutral . 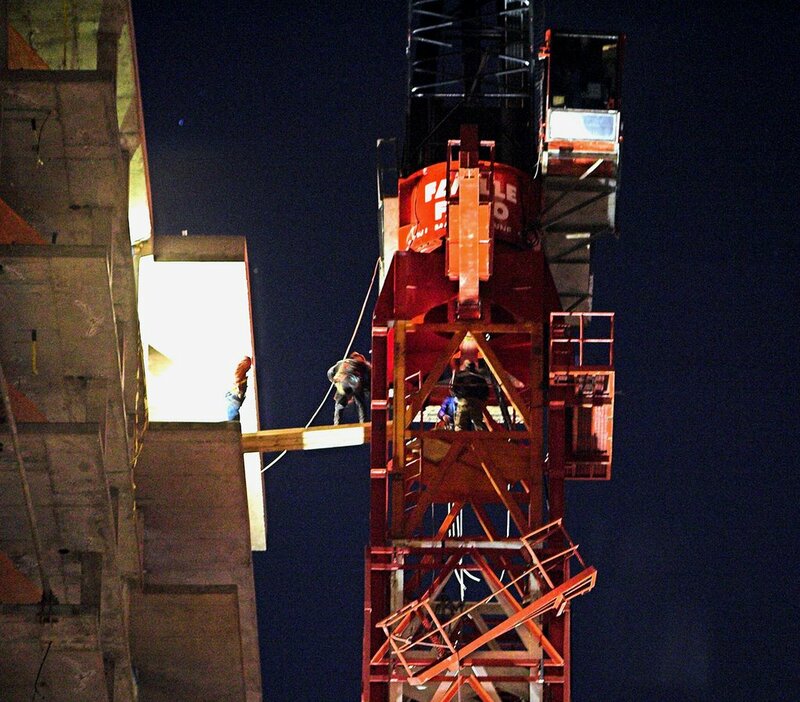 The 14000 lb cube of concrete suspended from the lattice boom provides along with the 40000 lb. 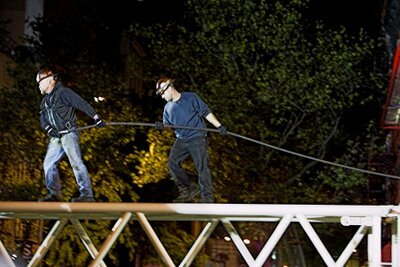 of counterweights the necessary conditions for this near dead neutral condition . 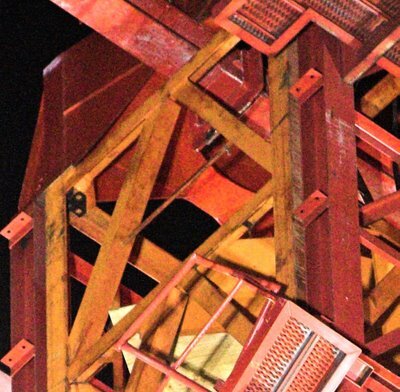 During this removal process the upper hoisting machinery is supported by 2 large hydraulic cylinders that are mounted on the sides of the red frame and are also attatched to the white tower sections at a lower point . The cylinders serve to lower the hoisting machinery to the next lower tower section while the surrounding red frame holds all in proper alignment using the uppermost tower sections as a sort of guide rail .When the hoisting machinery is finally resting on the uppermost tower section it is bolted securely to the top of this uppermost tower section . Above : Fireman using a theodolite to watch for movement of the tower . At this time the upper hoisting machinery had not been securely connected to the top tower section thus there was some possibility that some portion of the crane could topple to ground. Above : The problem : a severely damaged restraining pocket and 40000 lb.s of counterweights improperly seated askew in that pocket . Above : the hydrauic cylinder and the lower assembly that attatches it to the tower .Note that this lower attatching assembly is not connectected to the tower in any way and that the hydraulic cylinder is to some extent restrained to the tower by a strap applied earlier by Emergency Services personnel . Note also at the bottom of the red- orange frame an air wrench which likely at some time earlier had been used to undo bolts securing the tower section that fell to ground . 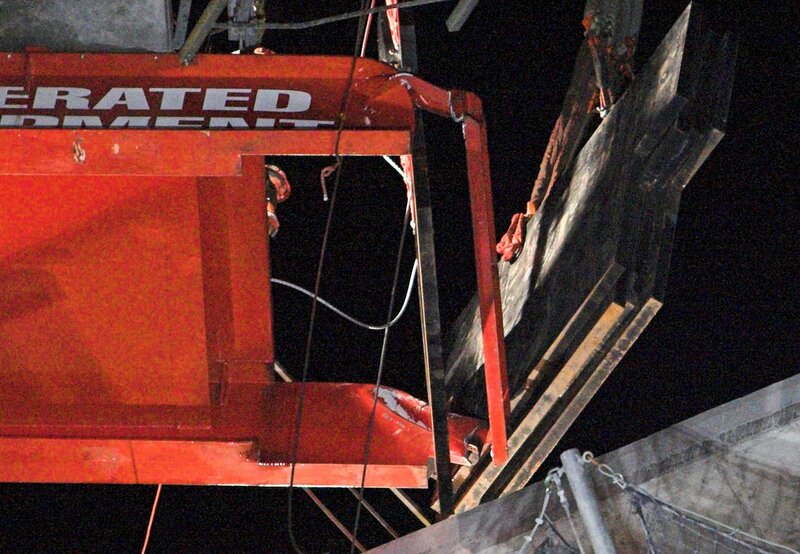 Here the redish- orange frame can be seen that probably did most to prevent the hoisting machinery from toppling to ground . Above: the upper portion of one of the 2 hydraulic cylinders used to raise and lower the hoisting machinery when adding or removing tower sections . Above : Assembly used to attach hydraulic cylinder to tower . Note the loose pin and the apparently stretched and drawn holes in the upper part of the assembly . Above: The orange top tower section and the redish surrounding frame are seen not to be square and in alignment with each other .Note the dark patch ( there are 4 such patches , one in each corner) in the upper left-hand corner with holes in it . This dark patch is where the orange tower section would normally be bolted to the hoisting machinery above . 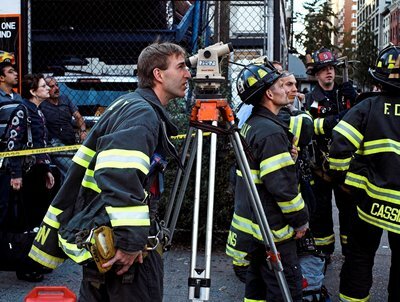 There do not appear to be any bolts in any of the holes thus but for the fact that Emergency Servvices personnel and crane operating personnel have in some manner secured the tower to the hoisting machinery the hoisting machinery assembly if subjected to a significant imbalanced condition of any kind would possibly topple to ground . 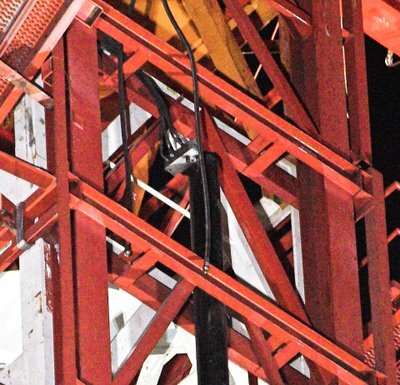 The outer redish -orange surrounding frame which sits with the top of the tower with-in it ,along with the rigging efforts of the ESS and tower owner personnel , probably provided the resistance to toppling that saved us from a much worse disaster . Above : 14000 lb. 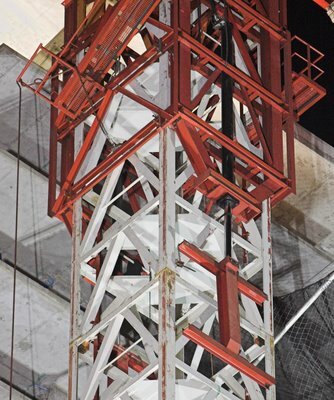 (approximately ) concrete cube used as counterweight during process of adding or removing tower sections . 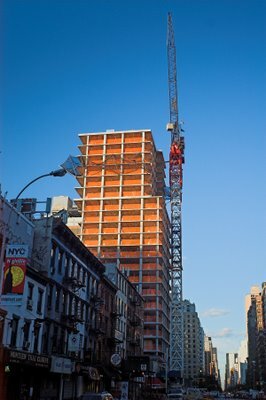 Tower cranes are prefered because they take up less street space .They go up with the building as it rises and when the building is finished they can be taken down quickly.They can move a lot of material up and down effeciently . 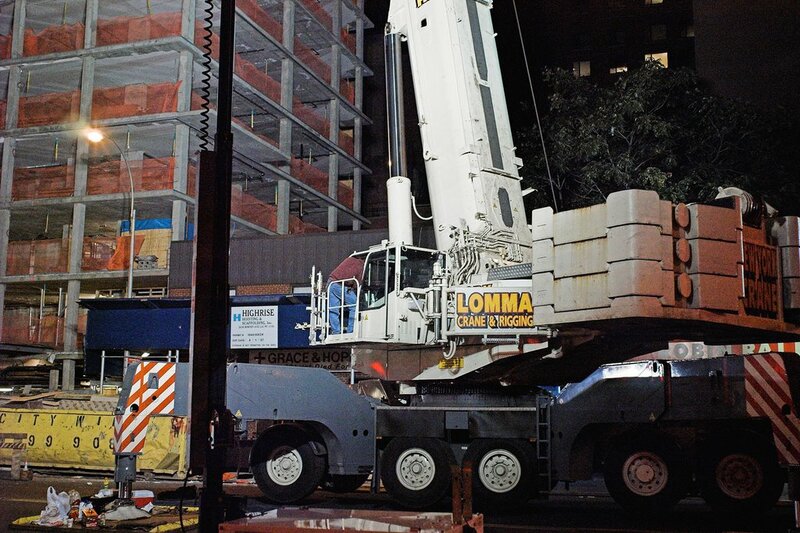 But there is one weakness with them :they must be very carefully and critically balanced while being supported by hydraulic cylinders when adding or removing tower sections to change the height of the crane .If properly maintained and operated they are safe . Thousands of them operate everyday around the world without incident . 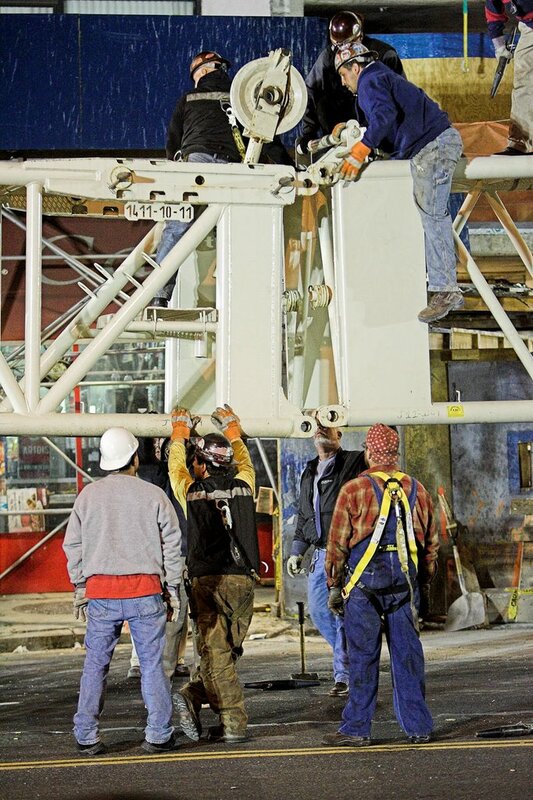 During the process of adding or removing tower sections to change the tower height , the concrete counterweight on the lattice boom ,the hoisting machinery and the 40000 lb.s of counterweights in the restraining pocket are in a critically balanced condition and are all supported by 2 hydraulic cylinders ,one on each side of the tower and held in alignment by the surrounding redish-orange frame . If there is a hydraulic system failure during this process there will be serious problems . Dept of Buildings engineers have announced that there was a hydraulic system failure responsible for this failure event . I have spoken to persons that were at the site ,at the top of the tower ,who have told me of the damage that they saw there .I have heard what they had to say about what they belived likely happened . From what I have read and from the first hand accounts I have heard of the damage I will attempt to relate what may have happened . 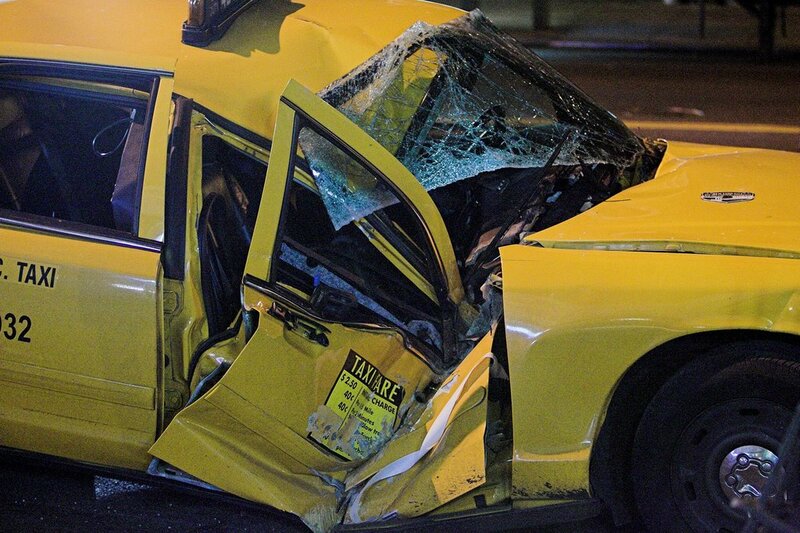 This was a very serious incident and could have easily been much more serious than it was . 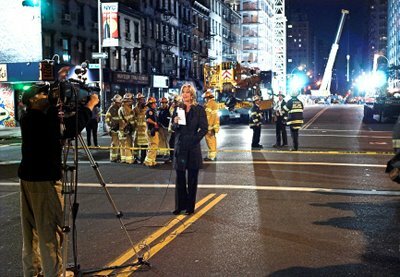 Insufficient attention has been paid to this event .Our city today is in a building frenzy and is not as safe as it should be because of this frenzy . 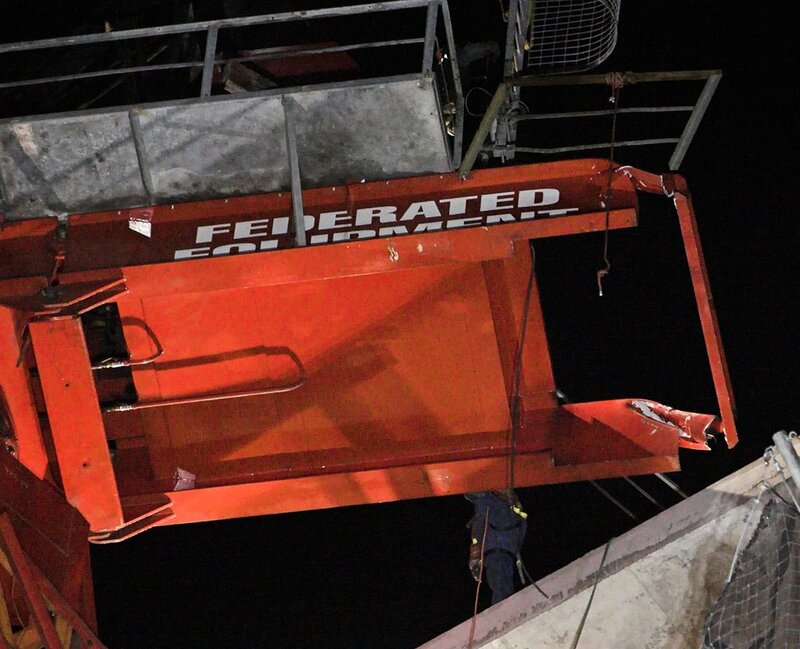 Since the building's concrete structure was complete there was no longer a need for the crane thus the tower crane was being removed from the site . 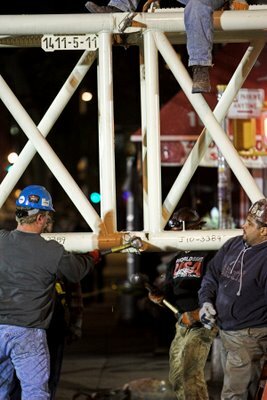 To remove the crane the sections that when bolted together comprise the tower are removed carefully one by one . 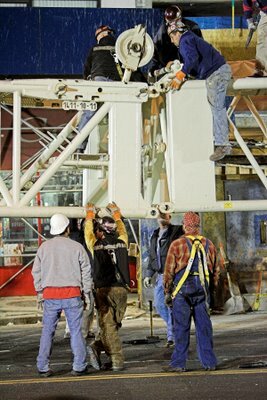 This process starts with the un-bolting of the connections between the section being removed and the hoisting machinery above and the next tower section immediately below . 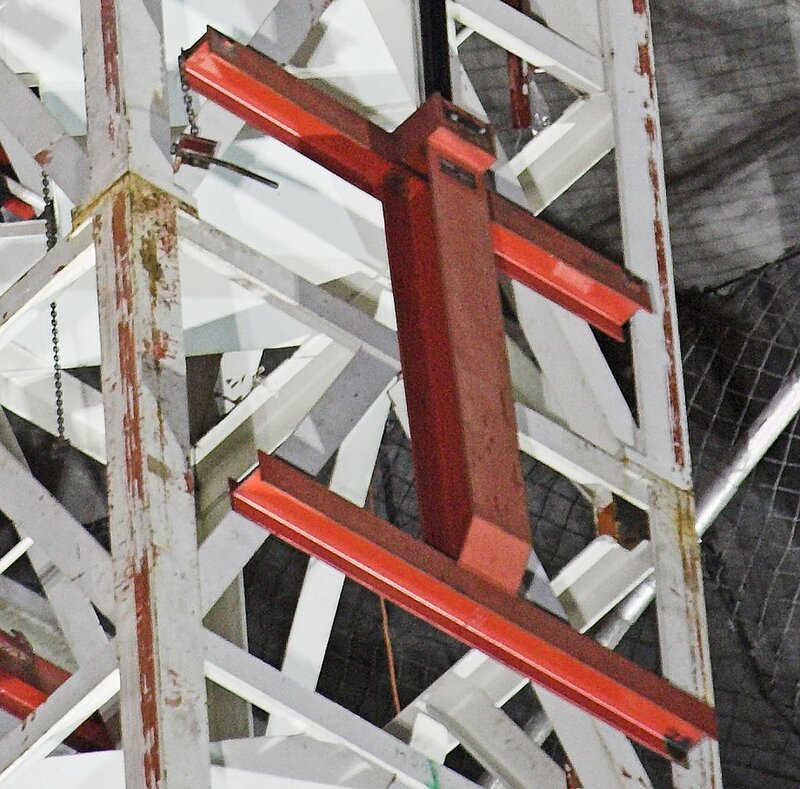 The section to be removed is attatched to a trolley- like device on which it will be rolled on the short steel boom directly above it to a position outside the tower where later, when all is bolted back together, the lattice boom will pick it and lower it to ground . 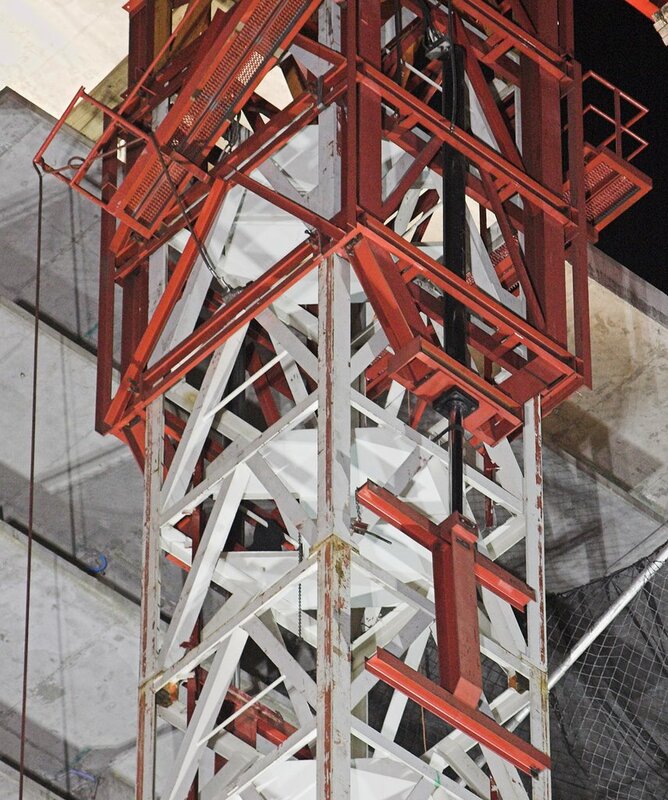 At this time the hydraulic cylinders have taken the weight of the hoisting assembly above and the surrounding redish-orange frame is holding everything in proper alignment using the lower tower sections below as a guide rail . When the the tower section has been moved outside the tower these cylinders will lower the hoisting assembly down with the redish-orange frame providing stability to the top of the next tower section where all will be bolted together and the crane will then pick and lower the removed section to ground . From what I have been told it was during this lowering of the hoisting assembly that the hydraulic system failed . 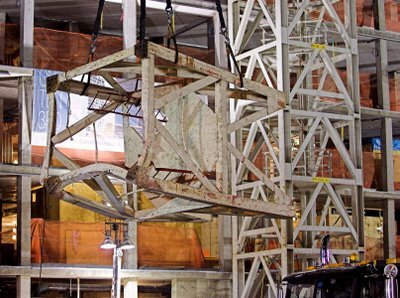 If the hydraulic system did fail at this point or if pins that were part of this hydraulically supported structural support system failed then the hoisting assembly ,the concrete cube and the 40000 lb.s of counterweights would have been in free fall . There would have been some rocking involved because of imperfect balance but such rocking should have been limited by the surrounding redish-orange frame . Then a very abrupt halt to this free fall occurred when the above mentioned elements struck the top of the top tower section . This abrupt halt in some combination with the rocking is what probably broke loose the recently removed tower section that was attatched to the boom outside the tower sending it to the street below . 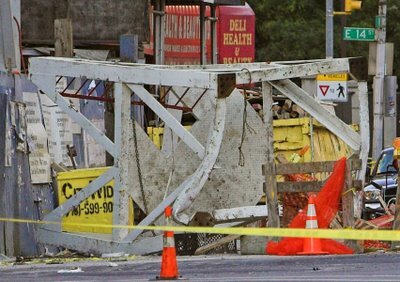 The broken and hanging walkway that the falling tower section probably hit during the very early portion of it's decent can be seen here only partly connected to the frame . During this period of falling , possible rocking and abrupt halt the 40000 lb.s of counterweights were either tossed partially out and about of their pocket , falling back into the restraining pocket askew and damaging the steel structure of the pocket , or their considerable momentum gained during their short free-fall event simply bent and crippled thier pocket frame when they were brought to an abrupt halt . How great the distance of this free fall was I do not know but it could not have been any more than the hieght of one tower section and judging from the damage done to the upper part of the tower probably considerably less than such a distance . What was left after this free fall event was an unattatched hoisting assembly and a seriously damaged steel structure supporting the askew 40000 lb.s of counterweights , all of which was in questionable condition of balance . The redish-orange frame surrounding the upper tower sections was still doing it's job holding everything more -or -less in alignment and also resisiting what ever out- of -balance generated toppling torques that now existed . The structural integrety of important parts of the tower were also in question . We were lucky because if the steel structure had not caught and supported the 40000 lb.s of counterweights , the upper hoisting assembly would have been more likely to have toppled to ground being pulled over by the considerable torque ( now unopposed by a reverse torque generated by the missing counterweights ) produced by the 14000 lb. concrete cube hanging on the end of the lattice boom . . Whether the tower toppled or not the job of disassembling the damaged tower would have been much more difficult and dangerous with the 40000 lb.s of counterweights on the ground leaving the upper potion of the crane severely out-of -balance .. Thanks to the efforts of the very competant Emergency Services personnel , Fire Department personnel and the tower owners riggers the tower was stabilized and eventually disassembled . 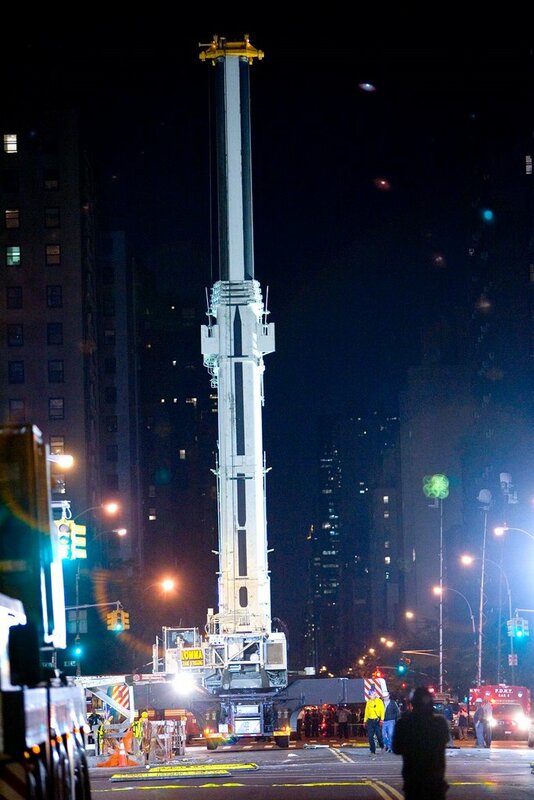 Above: Crane base with cab ,extended star-type outriggers and tons of counterweights. 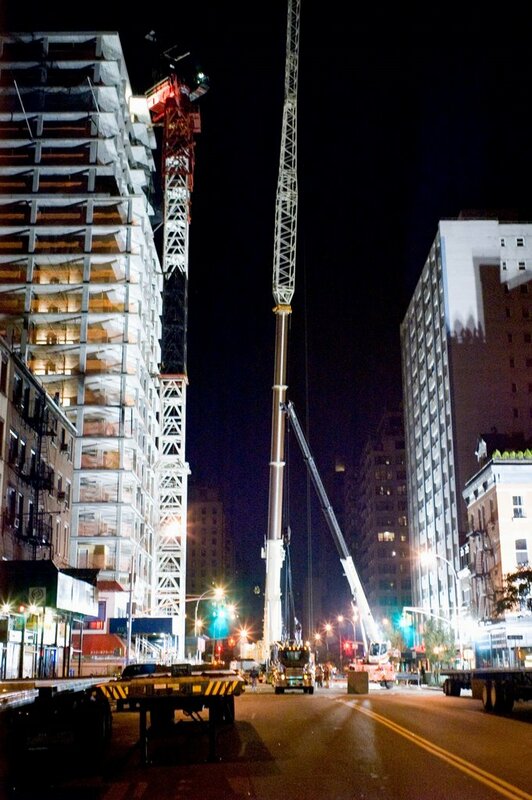 Above : Tower crane boom being lowered onto two flatbed trailers. 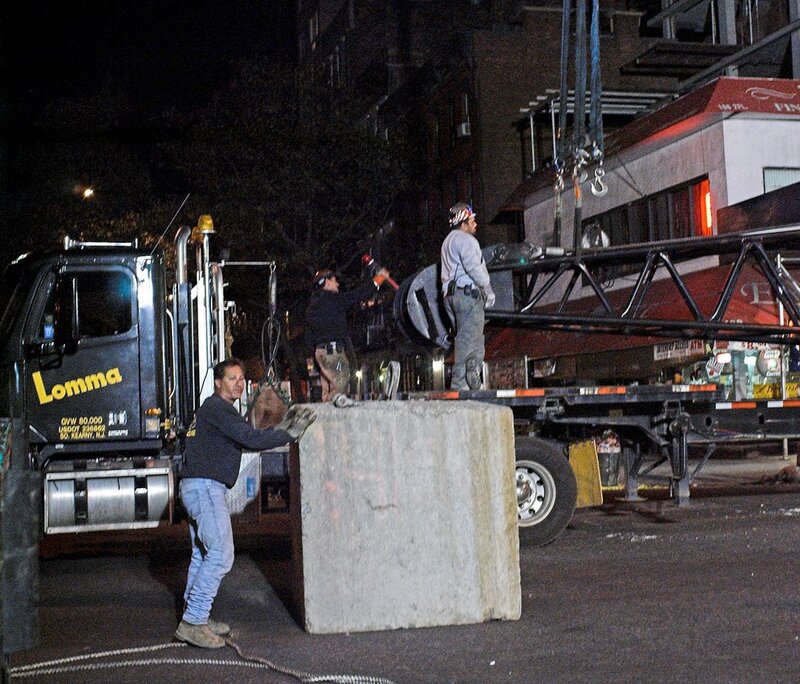 The boom will be separated into two sections with one half on each flatbed trailer . The crane that saved the night for the residents of buildings around 110 3rd Ave by disassembling the damaged Favelle Favco tower crane and making it possible for them to return to their homes was a Terex-Demag AC 500-2 , or very similar model , mobile telescoping boom crane with a lattice boom attatched .To learn more about this machine go to http://www.terex-demag.com/r_en/products/ac500-2.aspx . This site has a provision for the download of a PDF version of this machine's complete specifications. Unfortunately I have not yet been able to locate such good documentation for the damaged Favelle Favco tower crane . Before the Terex- Demag crane could go to work disassembling the damged tower crane the counterweights had to be delivered by flatbed trailer and then installed on the crane . When the counterweights arrived another smaller crane was used to place the counterweights on the larger crane. 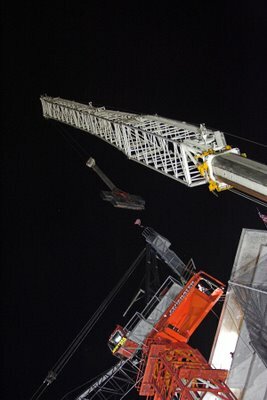 The next step in preparing the crane for action was to assemble the several sections of the lattice boom beginning with the connection of the first section to the head of the crane's telescoping boom . This required the assistance of the smaller boom crane , a lot of muscle and many hammers . The cable was then pulled from the hoisting machine at the crane base out to the very end of the lattice boom and passed over the large sheave mounted there . 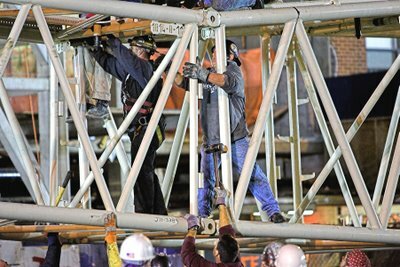 The boom was raised and the workers went to work disassembling and lowering to the street the several parts of the damaged tower crane . The area's residents were allowed to begin returning to their homes around 1 AM Saturday morning . The damaged crane was completly removed by late Saturday afternoon . Crane Failure at 110 3rd Ave. Above:The crushed cab. 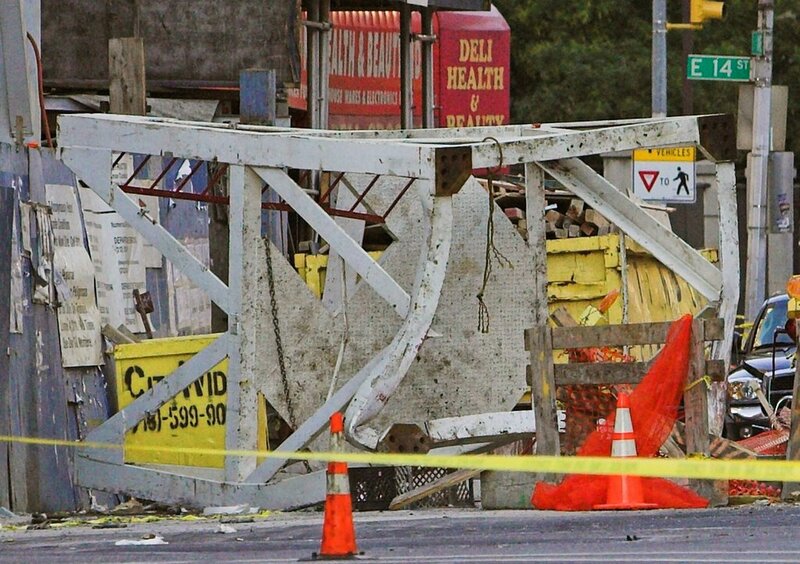 Below: The tower section that fell from the crane , hit the street and bounced onto the cab crushing the right side of the cab. Above: Emergency Services personnel attempting to secure the upper portion of the crane . Above : As always the news is there for the story . 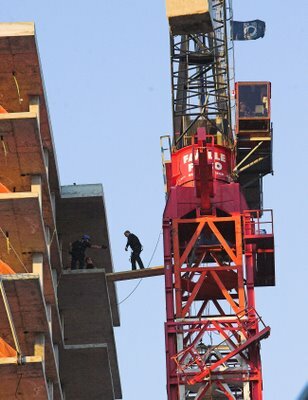 Above : Crane workers adding more temporary rigging to stabilize the crane for disassembly. 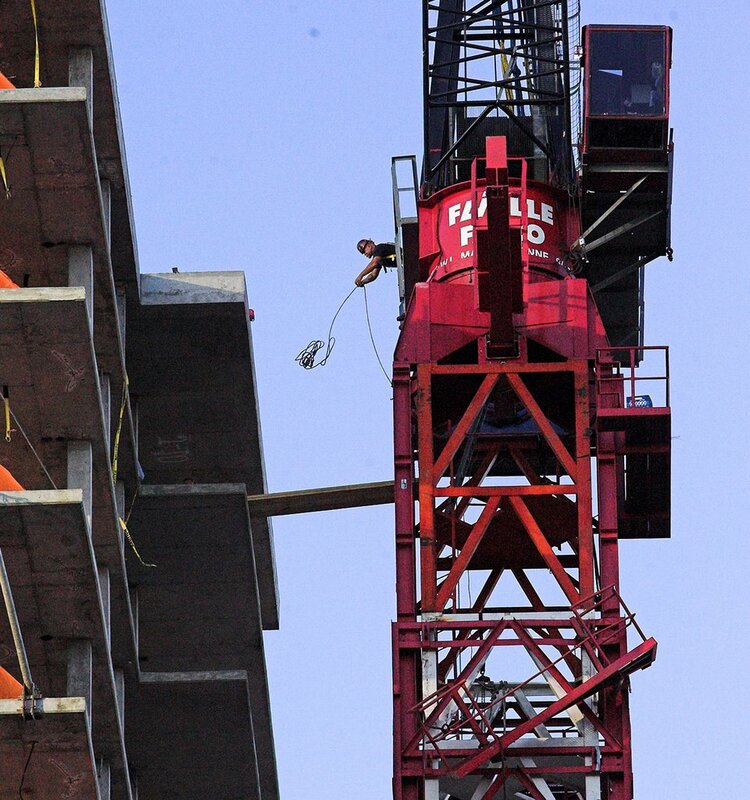 Above: The problem : Approximately 40000 lb.s of counterweights that have jumped out of the seriously damaged restraining pocket that holds them in place during normal crane operation . Above:The counterweights being picked from the damaged pocket that holds them during normal crane operation . 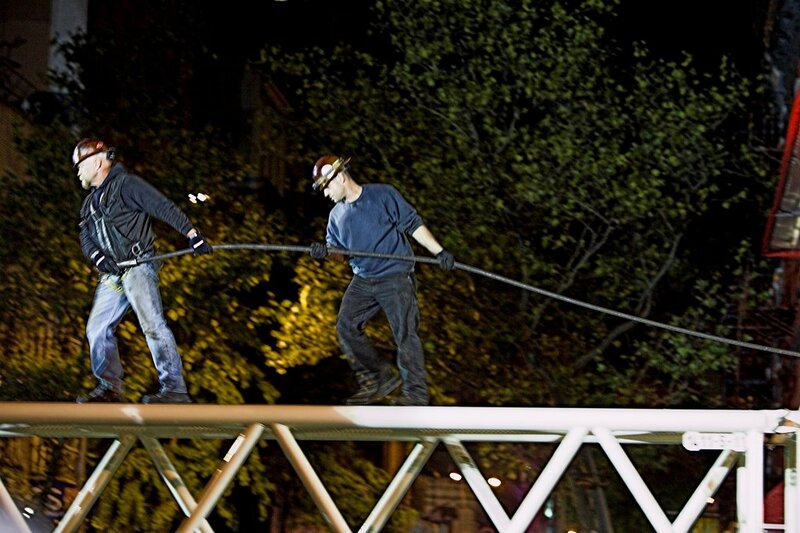 Above : Four of the five 8000 lb. counterweights being placed on the street. 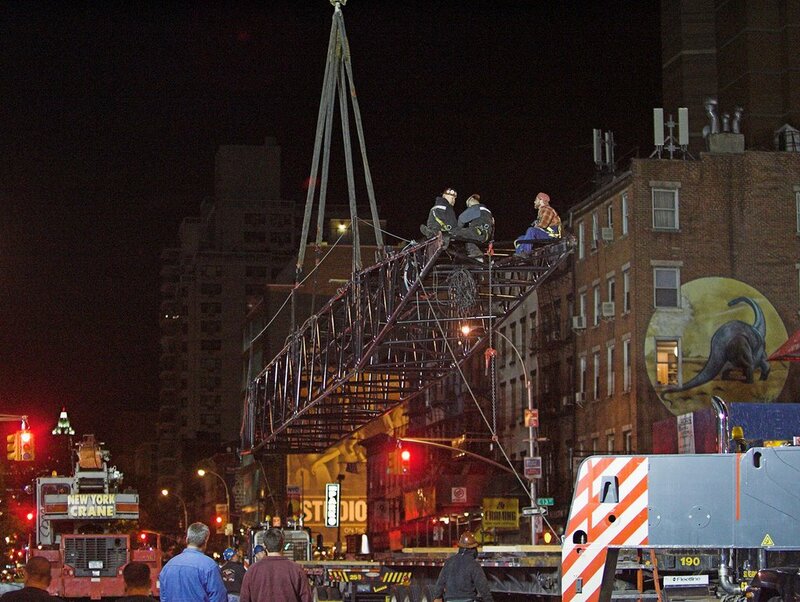 Above: The begining of the disassembling of crane truss boom . 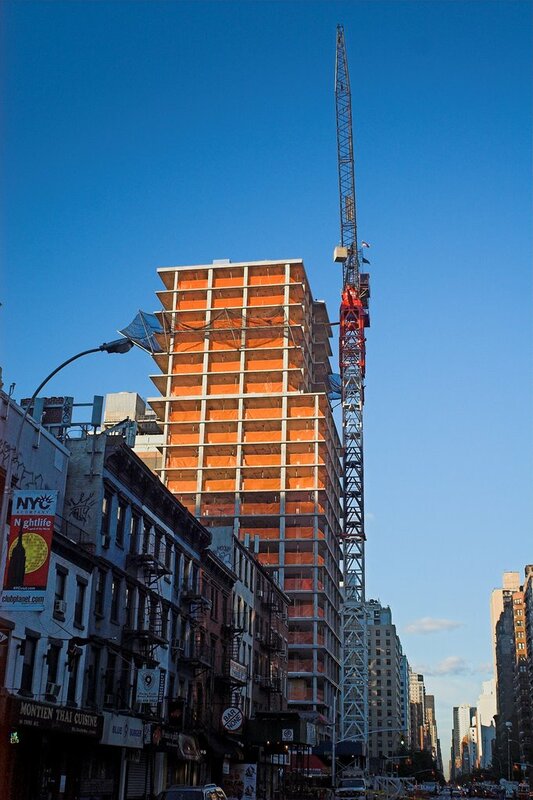 This is a picture summary of the crane failure at 110 3rd Avenue which occurred at around 4 PM on Friday afternoon 30 Sept. 2006. 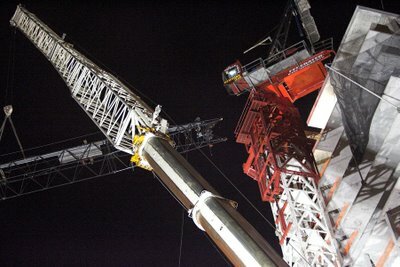 There will perhaps be as many as 4 more posts covering this event with the last post being a detailed analysis of the event with close-up detailed pictures of the structure of the crane . Late Friday afternoon a tower section fell from a Favelle Favco tower crane at 110 3rd Ave. , hit the street , bounced and dropped on a cab in the street crushing one side of the cab injuring 2 people . 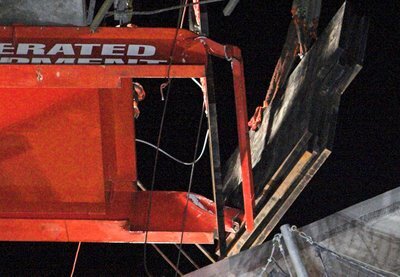 Three workers were injured at the top of the crane as a significant unexpected and seriously damaging abrupt movement and a jolting halt tossed them about the interior of the crane tower and operators cab . 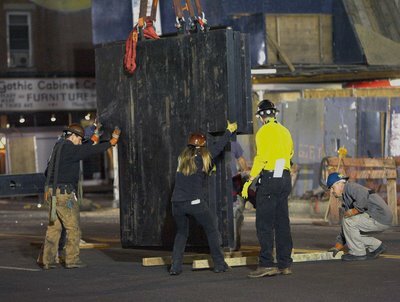 The abrupt halting of the movement also apparently broke loose the tower section which had just been removed from the tower assembly and was being prepared to be lowered to the street . The abrupt movement of the upper crane assembly also very nearly tossed 40000 lb.s of counterweights to the street which would possibly have resulted in the toppling of the large upper part of the crane to the street . According to a vague report from Department of Buildings engineers today , the crane suffered a hydraulic system failure . As more information is made available and as I can piece together information recieved from individuals who were at the top of the crane and saw for themselves the damage caused to the crane by this peculiar event , I will attempt to present a more detailed analysis of the failures that caused this near disaster in a later post .